THE BEST DRAMA IS IN THE LASHES! GIVE YOUR EYELASHES THE DRAMA IT DESERVES- ADDING THE PERFECT FINISH TO ANY LOOK! An exceptionally dramatic application that captivates and stuns. Gives your eyelashes the appearance of intense colume, fullness and length. Creates a fluffy, full set of lashes. Volume fans of 2-4 lashes on each isolated lash. Combines both techniques of classic and volume and create a natural cost effective balance. A great alternative to lashes for a natural curved affect. Give your lashes the lift it deserves with our lash lift services. Every few weeks you need to come back for a refill. Don’t wait too long between visits. Great a longer lasting deep colour in your lashes with this fast and easy lash tinting option. TIME FOR A LASH REFILL? HOW DO I KNOW WHEN IT'S TIME FOR A REFILL? How do i remove eyelash extensions? come in and let us professionally remove them. 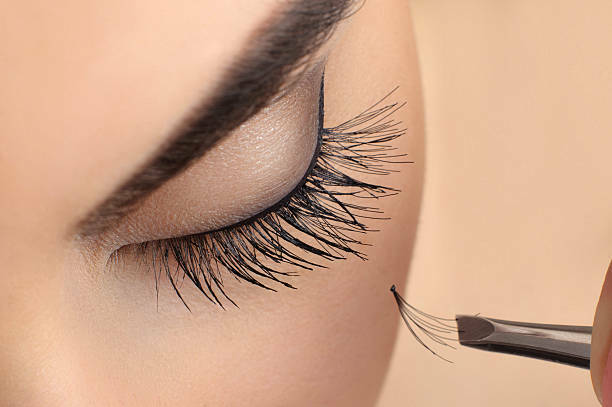 Eyelash extensions are made of synthetic silk and synthetic mink. Eyelash extensions are thicker at the base and taper to a fine point. We carry various lengths, thicknesses, curls, colors, and styles in order to provide each woman with a unique, realistic look. Can I Apply Lashes Myself? No, Applying eyelash extensions requires skill and precision. Extensions should only be applied by a certified and trained eyelash professional. Can I Use Growth Products On My Extensions? Natural lash growth products containing peptides will have no adverse effect on the longevity of your extensions. Growth products containing steroids will change the composition of your natural lashes and accelerate your natural growth cycle.